This is rather a tender boisterous sage so perhaps it needs frost to keep it in check. It is also rather pretty, another with spikes of blue flowers. When it was newly available, around 2003 and I was paying attention to it, there seemed to be lower (1m) and more upright forms (2m). If it has something to lean on it could go higher. Macrophylla self seeds or can be grown from cuttings. Now we have macrophylla x sagittata which grows about 1m high and has lots of sprays of heavenly royal blue flowers in warmer months. It tends to layer and extend its area so be prepared for that. It will be tender to frost to some extent. Around 2007 we got a shrubby macrophylla called purple backed leaf macrophylla. This is an interesting upright shrub around 2m with inky blue buds and blue flowers. I think I saw the same plant at Cabrillo in California in 2008. I think it is called ‘Big Swing’ in California after the name of Betsy Clebsch’s home. 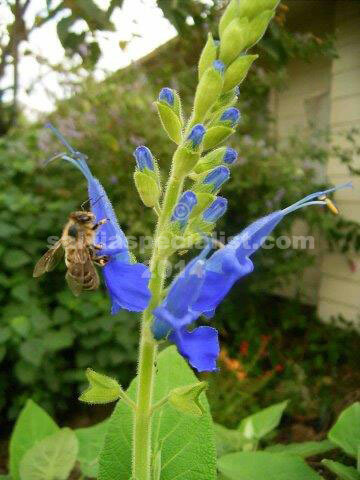 In the frost of July 2014 salvia macrophylla was one of the more tender salvias, even burnt worse than van Houttii which I usually consider VERY tender. To summarise sagittata is a small plant less than a metre, macrophylla x sagittata is about twice the size, and species macrophylla will be about 2m or taller with support. See sagittata page to order.